Now Brunette�s can glow, glisten and gleam with TIGI! 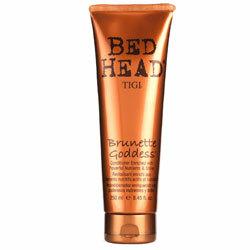 TIGI Bed Head�s Brunette Goddess Shampoo & Conditioner not only provides ultimate shine and nourishment but will enrich auburn tones too � whether it�s natural or colour enhanced! Plus, thanks to a next generation Liposome Delivery System, hair will be treated to a slow-release of vitamins A, C and E for better, longer lasting performance. The conditioner is packed full of added extras such as Soy and Wheat proteins to revitalise shine, luster and smoothness; Jojoba Seed Oil creates a protective layer over the hair shaft to help retain moisture; and Panthonol helps strengthen hair, increase resistance to breakage and reduce split ends! Apply to wet hair to feed your inner goddess! Our liposome delivery system releases nutrients into your hair. Soy and wheat proteins retain moisture and revitalise shine. Panthenol strengthens your hair to help resist breakage and reduce split ends. Brunettes do it better! Smells gorgeous and leaves hair really shiny and moisturised. Fabulous product.